Horses are uniquely qualified to help us learn about ourselves. Horses are prey animals. Therefore, they are acutely aware of their surroundings and everything in those surroundings. The horse's body language reflects what is going on in the environment. 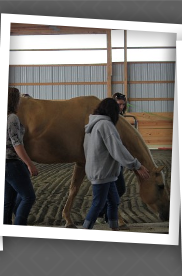 If you can read the horse's body language you get insights into the person or group that is working with the horse. The feedback the horse gives you is immediate. If energy shifts within the person or the group the horse will reflect that. The shift may be positive or negative. Observing the horse's reactions gives the facilitator focus points during the de-brief. Did you notice when..... what was going on with you (the group) at that point? It truly helps create self awareness in the person and in group dynamics. It helps people understand how one person affects those around them. Horses cannot tolerate incongruence, therefore it is impossible to hide from the horses. If a person is afaid or hesitant but putting on a brave front the horse is going to know and the horse's body language will reflect that. A person doesn't have to conquer that fear to affect change in the horse but they do need to acknowledge teh fear. The facilitator may not be able to pick up on the facade and the true emotion. Again the horse's body language gives the facilitator insights to be used in the de-brief. Horses live in the moment. So what they are reflecting back to us is what is happening right now. Not what happened last week, not what is going to happen in 2 hours. So the feedback we get is pertinent to right now and the issues that need to be dealt with right now. The good news is that the issues brought up by the horses are the things that were probably affecting us last week. When the horses bring it to our attention and we reflect on it, we can come up with a plan to affect chage starting immediately. It is the facilitator's job to help the client reach that transformation. The horse/human cnnection is actually a very odd one. The horse is a prey animal and humans are a predator. It astound me that we have been able to make a connection with these animals. Even though we have that one major difference we have many things in common. Both species are intensely social and have interdependencies. Trust, respect, and integrity are important in both social structures. How these are manifested in each social group is different. As a predatory species we compete for survival, power, and control. We have a hierarchy that is highly competitive. Horses have a hierarchy also but it is not competitive, it is based on cooperation for the good of the herd. A horse's leader (the alpha) leads without fear, has the herdsw best interests in mind, they contribute to the herd, they have a keen sense of environmental awareness, and are assertive. The alpha will change over time based on who in that herd is most capable of taking care of the herds needs. As humans we tend to be myopic and don't really see what is going on in the environment around us. 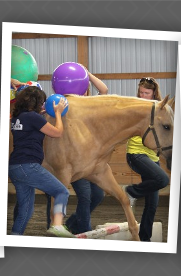 Horses need to be aware of the changing conditions and the environment all the time and make adjustments as needed. They have excellent peripheral vision that allows them to come to a resolution quickly and for the good of the herd. Horse Herd dynamics demonstrate a culture of cooperation with the best interest of the whole herd and the individual in mind. When we are with horses they are allowing us to be part of their herd. They are giving us the opportunity to learn form them and create within ourselves the same attributes that will allow us to create a culture that values the individual, choose leaders that have everyone's best interest at heart, and values a culture of cooperation over competition. 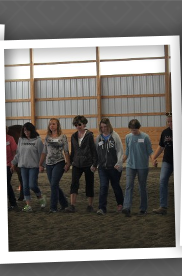 When horses are partners in experiential learning they relfect emotions, behaviors, attitudes and ideas. 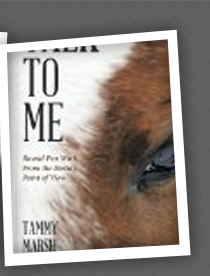 The way we interact with the horses is how we interact with other people in all areas of our lives. 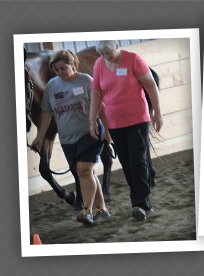 Partnering with horses will give us insights into the quality of interactions and how beneficial they are. The horses give immediate feedback. When that feedbackd is reflected on we can identify the most effective way to reach our goals.